When days darken, cold winds blow, and the damp settles into our lungs and bones, we can turn to our ancient plant allies, the evergreen and ever vital, conifers. Towering over the forest canopy, their top branches are always nourished by the sun but their roots extend deeply into the earth. And when winter makes demands on our reserves of energy, endurance and warmth, we can count on their grounding and revitalizing energy for support. In this post, we’ll explore the many ways (from foods, teas, oils and salves) conifers nurture your body and brighten your spirits – during the season we need it most. And please explore the links, you’ll find all kinds of recipes and simple DIY tips on how you can make culinary and medicinal conifer magic at home! And it’s no wonder they were traditionally used in many healing remedies. The volatile oils found in pine, spruce and fir needles, bark, sap and resin are used by herbalists and aromatherapists to help stimulate the respiratory system, decongest the lungs, boost the immune system, balance hormones, and bring circulation and warmth to cold muscles and stiff joints. And as anyone who has smelled their fresh-cut branches already knows, their enchanting fragrance is a medicine all its own, helping calm the nervous system, reduce stress and cortisol, revive stamina and provide feelings of peace and wellbeing. Plus they’re delicious! Citrusy and herbaceous, studies have identified over 39 flavour compounds in pine needles and over 81 in pine bud/tips alone! There are even conifer enthusiasts (and here) who have analysed their taste signatures, describing pines as heady, sharp and lemony, spruce as resinous and fruity with a rosemary-like flavour, and firs as sweet with candied orange peel overtones. And they’re super easy to incorporate into a wide variety of foods. You can toss chopped needles into vodka, vinegars, finishing salts and even blend them directly (with a food processor) into sugars. (link here). My favourite seasonal use for conifer sugar is shortbread – I cream it into butter when making the dough and sprinkle on top once the cookies are baked. Coarse sea salt, grand fir needles, sheep sorrel & nettle seeds, dried oregon grape blossoms, dried orange rind. Conifer salts, especially made with grand-fir, give a wonderful flavour to fish, roasted meats and are great sprinkled straight up on apples or celery. Conifer needles are especially wonderful in teas. My hands down favourite is again the sweetly flavoured Grand Fir, with its distinct tangerine or grapefruit top-notes. It is easily identified by its needles which lie flat on the branches, alternating short and long. The underside is creamy with a long stripe of green down the centre. Just add a handful of needles to a cup of boiling water and let steep for 15 minutes. A tea made mostly from fresh needle tips will be brighter and sweeter, while one made with older needles will be more earthy and woodsy. I throw in small twigs because the bark (high in antioxidants and anti-inflammatory properties) adds even more rich flavour, with just a hint of resinous bitter. It’s also nice to add a pinch of warming spices like cinnamon, nutmeg or cloves which bring their own potent antioxidant and anti-inflammatory qualities to the brew. Pine needles are also especially delicious in teas. Fresh or dried conifer needles (about a cup) can also be wrapped in a cloth bag and tossed in the bath for a revitalizing soaking. And blended with sea or Epsom salts, they can be incredibly relaxing. I love to mix in dried rose petals and bits of cedar for additional fragrance. You could even further customize your blend by considering each conifer’s differing medicinal and energetic effects. According to this aromatherapy site, the oils of firs are warming and invigorating, while relieving nervous exhaustion and stress. Spruce helps support the adrenal glands, stimulate and increase energy, and are “centering, calming and focusing”. Their needles can also make wonderful homemade oils and warming salves for topical application on the skin. These are beneficial as muscle rubs, bringing blood flow and circulation to stiff winter bodies, muscles and joints. They make a great lip balm too! And let me tell you, on chilly winter days, a conifer salve makes a perfect accompaniment for yoga. (Recipes can be found here and here.) Massaging its restorative fragrance into the skin (which also contains scent receptors) before or after practice leaves you feeling supple and resilient, well, as an evergreen. According to aromatherapists, their oils and fragrance are said to support and stimulate different chakras as well. Pines represent the “the oldest aromatic energy on the earth” and are “linked to the oxygenation of our planet”, therefore their energy is grounding and supports the heart chakra and respiratory system. Canadian Hemlock “stimulates the imagination and inspiration while stabilizing the nervous system” and enhances the 2nd, 4th, 5th and 6th chakras, while Western Hemlock can “help dispel disturbances in your energy fields which are disrupting your health and well-being”. And for our European ancestors, the female life-giving magic of conifers was also honoured. During Yule festivities across the northern hemisphere, trees of pine, fir and spruce were revered as embodiments of the goddess (the Tree of Life) who never dies. And on the winter solstice (the longest and darkest night of the year) they were decorated with candles and ornaments symbolizing the everlasting light of sun, moon and stars, in her undying branches. We still partake in this enduring mystery when we stand before our own lit trees during this season. But we can also call on this old feminine wisdom by crafting a little evergreen magic of our own. So when the cold winds blow and spirits flag, brew up some tea, take a conifer infused bath, inhale their oils, and warm your skin. And to close here is an easy recipe for a festive, tasty and medicinal evergreen tonic syrup. You can use to this to brighten Yuletide foods and drink, but also as a tonic when you need a fortifying boost and feel a cold or flu coming on. And this festive season, it makes a wonderful flavour-packed syrup for tea, cocktails, and desserts. So gift yourself and those you love, with some conifer inspired comfort and joy! Reblogged this on Writing one page at a time. This is all so interesting !!! I can vouch that pine-branch tips arer delicious as a tea. They’re also expectorant, decongestant and a splendid vitamin C source–that’s why they’re tangy–so they’re great for a cold. I live in texas and always want to use the pine trees around me but I’m scared. Any tips? Just follow the tips & links at the bottom of the post for the conifers to avoid. Sorry, I can’t give more specific advice as I’m not sure what conifers are growing in Texas! Wow! Beautifully written – and of course – I so agree. This is incredible information, and I hope to forage from trees myself soon 🙂 brilliant! As we transition from autumn to winter, conifers are a reminder of the living energy of Mother Nature – their vibrant green needles brighten our day against the winter landscape, and are a source of energy, vitamins and medicine throughout the year. I am sharing this wonderful and informative post from Gather Victoria on the Healing Powers of conifers. Enjoy! Thank you for this wonderful and informative post. This is the first time I’ve reblogged anything – thank you!!! We gathered some fresh pine tips this past spring. Now we know what to do with them all. Is there a book from this writer? Very cool! I want to add an additional ‘recipe’ for your consideration. Many years ago, while on a cross-Oregon bike ride, our group was enjoying a rest stop (food, water, bike adjustments) at a wide place in the road next to Lake of the Woods (in the Oregon Cascades, near Klamath Falls). Randomly, a white-haired guy in old battered pickup truck came along, slowed, looked us over, and pulled in behind our support vehicles. He got out, walked over and started chatting with a few folks, some of whom followed him over to his truck, where he pulled out giant water coolers full of ????? Pretty soon we could see him passing them paper cups of something to try. Curious, I headed over, and soon got a taste for myself, of what he called Branch Water. Cold, refreshing, sweet and delicious. He was, and I’m sure still is, a one-man promoter of branch water, and the cherishing and restoration of our Pacific Northwest evergreen forests, along with our salmon. He is an artist, historian and activist, and as far as I know, still lives in Lake Oswego. Branch Water is even easier to make than your simple recipe for fresh evergreen needle tea, and wonderful for summer. According to Mr. Long, early explorers were cured of scurvy when native people gave them this remedy. It is high in Vitamin C. Here is the recipe from the photocopy handout he gave to us. This is so wonderful! Where did you find the dried Oregon grape blossoms? I don’t live in Oregon any more and would LOVE to make the finishing salt for Christmas gifts! I dried them myself, but right now in the Pacific Northwest many are putting out a second bloom – take a look before the frost gets them! This is beautiful, your bath salts sound amazing! wish I was close enough to get grand fur. You can use douglas-fir, spruce, pine and/or cedar! This is so beautiful. …was wondering if you use dried or fresh in your bath salts, I want so much to make this for holiday gifts. Hi! You can use dried and fresh in your bath salts. But the needles should be dry if you want to give the bath salts away. While it’s highly unlikely they would mold, you don’t want to take the chance! I made it and gave it a try in the bath last night….was hoping for more pine aroma…. In your post you say, “Pines represent the “the oldest aromatic energy on the earth” and are “linked to the oxygenation of our planet”, therefore their energy is grounding and supports the heart chakra and respiratory system. Canadian Hemlock “stimulates the imagination and inspiration while stabilizing the nervous system” and enhances the 2nd, 4th, 5th and 6th chakras, while Western Hemlock can “help dispel disturbances in your energy fields which are disrupting your health and well-being”. I was just wondering, when you say “pines” does that description of their power carry over to firs? Second, I am trying to make sure I understand the trees you mention. So, is Canadian Hemlock Tsuga canadensis? Does this grow here in the PNW? Thanks. I just made up a batch of Doug Fir syrup and it is delicious! Hi, I’m not sure if the volatile oils in Fir and Pine have similar effects…but as they are in the same family I can’t see why not! 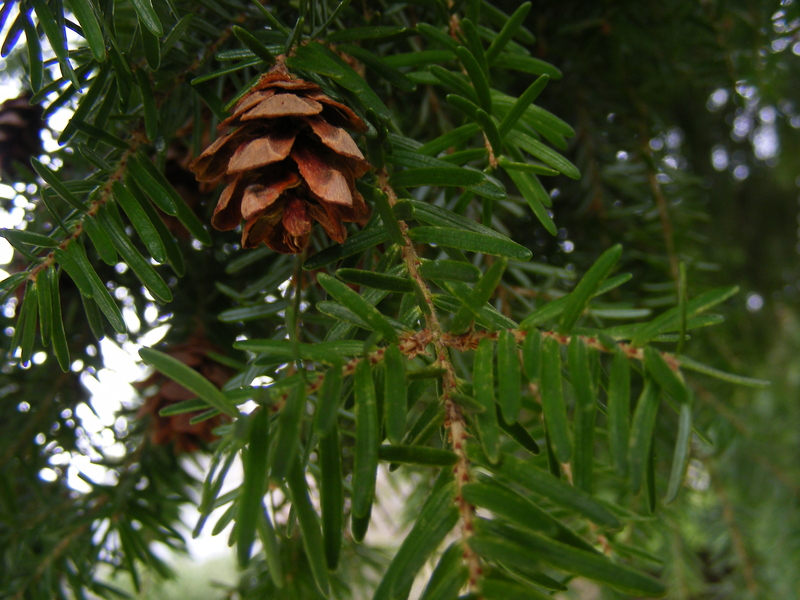 Also I’m referring to Western Hemlock in the article not eastern, but it is also edible! Hope that helps. And yes that Douglas-Fir syrup is so lovely! So beautifully written with love and affection for our green allies.